The Aconcagua Rapid Ascent team arrived safely and they are already enjoying the good food of Argentina. Everyone is feeling good and looking forward to getting higher in the mountains. 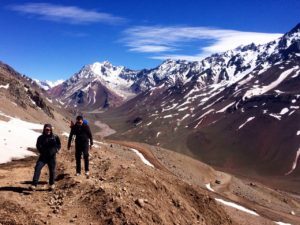 The team got their permits, and left Mendoza for the town of Los Penitentes (8,540′ / 2600m). Los Penitentes sits at the entrance to the valleys leading into Aconcagua. They spent a couple of hours organizing equipment and food for their climb and are currently waiting for a good weather window to take the helicopter to base camp. Today they did an acclimatization hike to Cerro Santa Elena (13,800′ / 4206m) to get used to life at this new altitude. The expedition team in Mexico also arrived safely, as did their bags, which is always good when traveling internationally. This expedition is called the “Volcanoes of Mexico Climbing School“, and the focus is to attain the basic skills of mountaineering with a focus on safety and education in just one week. Yesterday the team toured Mexico City, including the Palacio de Bellas Artes and enjoyed a nice dinner in the historic center. They have already begun the process of acclimatization with Mexico City’s high elevation (7,382′ /2250m). The team then traveled up in the Mexican highlands and spent last night in the Altzomoni Hut (13,000′ / 3060m) on the flanks of Ixtaccihuatl. 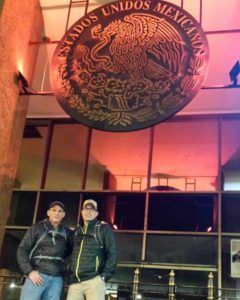 The expedition team in Ecuador arrived safely, with only one travel delay, which happens easily with international travel. Yesterday our “Ecuador Climbing School” expedition team acclimatized and explored the old city of Quito (9,350′ / 2850m). Today the team had a good, hard day acclimatizing on Rucu Pichincha. They rode the telepherique from the center of the city to 14,000′ / 4267m. Two hours of hiking brought them to the rock ridge of Pinchincha’s summit (15,700′ / 4785m). They had decent weather, only a little hail and rain. This climb is a proud accomplishment on its own and it is also important part of their acclimatization for Cayambe (18,996′ / 5790m). 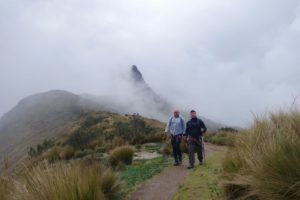 Tomorrow they are leaving Quito for Otavalo and another hike- this time up Fuya Fuya.